Book your Uganda accommodation or hotel reservations at affordable rates whether luxury, mid range and budget with katona tours. We arrange camping tours and group safaris to all National parks in Uganda. Located in Murchison falls national park in the north west of Uganda. The 40 meters wide River Nile, on its journey from its source at Lake Victoria to join Lake Albert, is suddenly compressed into a gorge only six meters wide, and cascades into a boiling pot 43 meters below. The earth literally trembles at Murchison falls, one of the world's most powerful flows of natural water. Like most Uganda safari lodges, paraa lodge offers facilities such as lounge, bar, restaurant, swimming pool, natural gardens in a beautiful landscape. 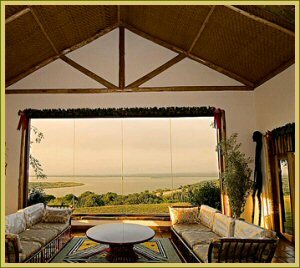 Paraa Safari Lodge enjoys simply astounding views as its elevated high above the falls on the north side of the river. Nile safari lodge was established in 1993 and is located on the edge of the Victoria Nile in Murchison Falls National Park, amongst rich papyrus forest. The lodge has got 12 bed rooms of which include ensuite tented accommodation and spacious log cabins, strategically set to enable magnificent views of the Nile and has got an open fire to keep you warm all night long. The camp has six chalets made of wood, rope and stone and and six luxury tents, all with en suite showers, flush toilets and comfortable, airy rooms with electrical lighting. The design of the camp blends with the natural environment. Enjoy an early morning tea/ coffee served by your personal waiter/waitress. The camp is a paradise for honeymooners and an ideal holiday destination for those who quest for solitude. You will fall a sleep un aware, enjoying the lullaby of the waterlife in proximity with your cabin! Near the park entry, lays the buhoma community campsite on a slope facing a forest gallery. A bed in a six berth dormitory costs USD 8 per person while twin and double bandas cost 10 USD per person. Camping is permitted at USD 3 per person. Drinks and meals are also available on request at USD 4. Located on a peninsula within the heart of the spectacular Queen Elizabeth National Park, Mweya safari lodge is a luxury lodge recently renovated. It has sumptuous accomodation, breathtaking views from every room, and an abundance of game and some of the best bird watching in Uganda. Semliki safari lodge [Toro game reserve] is the only accommodation in 500 square kilometers of the western rift valley wilderness .Its a reserved lodge constructed with local African materials which gives it a unique look compared to other lodge. This is a well established hotel with timber, marble, art and architecture all portraying African culture. Located 1km away from the town the hotel has 23 Opulent rooms en-suited with bathroom and bathroom amenities, telephone, Dstv, 2 swimming pools, conference halls and public address system. Located in the middle of the park and overlooking Lake Mburo, mantana tented camp enjoys a hilltop location 3.5km north of rwonyo and has 8 tents. It’s a luxury Tented Camp, consisting of eight unique safari tents in African style. The tents are raised on a wooden platform, with a private veranda overlooking the forest. Each of them is tastefully decorated in African style, with comfortable twin beds, large windows and en-suite bathroom. There also renovated cottages with verandas and spacious bed rooms and occasionally monkeys pass by. Food stuffs are served at the customer’s request. Mount mgahinga rest camp lies in the shadow of the dramatic Virunga volcanoes and has 7 bandas (cottages). This high end safari lodge overlooks the Narus Valley. It has comfortable rooms for tourists taking safaris and tours in Kidepo valley National Park. At apoka there bandas a having beddings, mosquito nets, hot showers, fresh drinking water and firewood provided .Foods such as drinks are available but better to come with your food.